Is it any wonder Adut Akech is shortlisted to become the British Fashion Council’s Model of the Year? She has captivated us ever since she made her exclusive debut on Saint Laurent’s Spring 2017 catwalk, moving on to cover Vogue Italia, i-D and Edward Enninful’s first-anniversary issue of British Vogue. Not to mention, becoming the face of mega brands Moschino, Zara and Valentino. So we certainly can’t blame Vogue Australia for giving the December 2018 cover to the Sudan-born beauty. The magazine profiles Adut as she returns to her family home in the city of Adelaide, photographed by Charlie Dennington and styled by Jillian Davison. Dressed in a vibrant Schiaparelli number, Adut is joined by her adorable baby sister Akuol for the sweet cover, which is sure to brighten your day. Our forums loved it. “What a gorgeous cover, this will look so lovely at the newsstands,” admired Miss Dalloway the second the cover came to light. “Beautiful and vibrant. Love Adut!” exclaimed Nepenthes. “Absolutely gorgeous cover (also that baby is a born model)” forum member bluestar added. “This cover made me smile. It looks and feels so pure,” MON said. 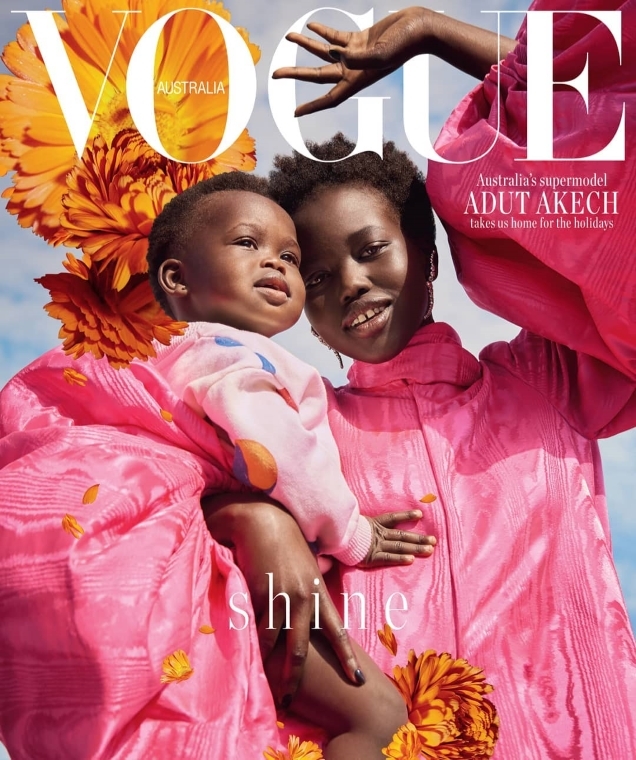 “Love everything about this cover – Adut, her baby sister, even the flowers seem suitable here. Very bright and summery. So happy for Adut, she is having such a great year!” applauded Tauriel. Lola701 could not have agreed more. “Very happy for Adut! She is really the model of the year,” she heralded. Await Adut’s cover shoot and share your thoughts on her second Vogue cover of the month here.